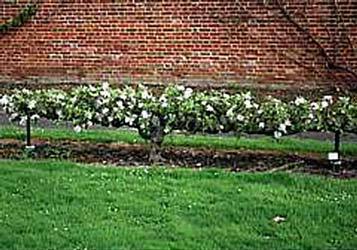 The word espalier describes training a fruit tree onto a wire or trellis, allowing it to grow in a structured way along a fence or wall. Like many things, it can be done in a relatively simple way of it can be made into an art-form. 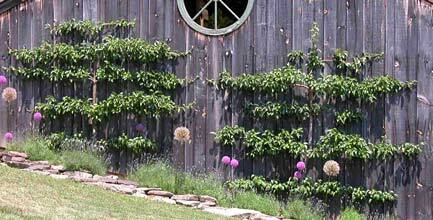 Not only are they a very beautiful way to grow your fruit trees, but they have the advantage of being able to pick the fruit without using a ladder, easy to throw a net over to protect against birds and makes pruning decisions quite simple. This is our favourite method of espaliering, and the simplest. The tree is planted vertically and pruned off above the lowest wire. In the following growth year, branches shoot from either side, which are then tied onto the wire. See our articles for full instructions. 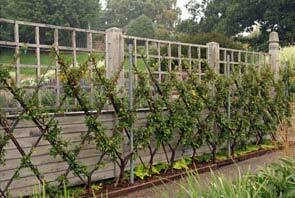 Bob Magnus's KNNN Espalier system. This was Bob's idea for espaliering a modified horizontal cordon. It does save one year of growth by bending the whole tree onto the wire. However, the disadvantage over the horizontal cordon is that you get only 4 horizontal branches for 4 wires rather than 8, that often the next leader doesnt present itself at the bent branch like one hoped (i.e. one year wasted) and the pruning is less straight forward. 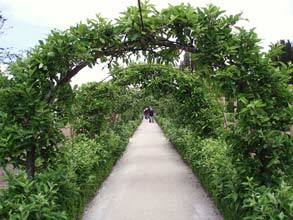 Planting occurs at a slight angle and bending the length of the tree onto the bottom wire. 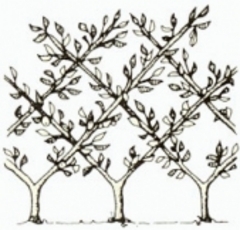 The following year, the upright branch closest to the stem gets lain onto the next wire. See our articles for full instructions.